A London mother’s worst nightmare came to life when she found dozens of venomous spiders crawling over a bag of newly-purchased bananas. Just as Consi Taylor was about to bite into one of the Sainsbury’s bananas, she realized that white spots she assumed were bits of mold were in fact dozens of tiny baby spiders that Taylor had the presence of mind to photograph. They turned out to be infantile Brazilian wandering spiders, which are among the world’s most deadly arachnids. Taylor immediately returned the bag of bananas to the Sainsbury’s store, which offered just $16 as compensation. She then sent the photo she snapped to a pest control specialist, who quickly warned her and her family to high tail it out of the infected apartment and stay away until it was properly fumigated. Brazilian wandering spiders, also known as “banana spiders,” are no joke. Aside from being extremely venomous, the little buggers can grow to a terrifying six inch leg span. They are also known for their aggressive nature, hunting and attacking their prey. Their venom is one of the few that poses as a threat to humans if bitten, even causing death in extreme cases. The Taylors spent several days at a hotel while their home was rid of the Brazilian wandering spiders, and Sainsbury agreed to foot the bill. Wow. That is definitely something you don't want to see in your bag of bananas. The post mentions the venomous spiders were one of the world's most deadly spiders; The Brazilian Wandering Spider. This is partially correct but should be note that not only are they one of the world's most venomous spiders... are ARE the world's most venomous spiders. According to the Guinness Book of World Records. I hope everyone is ok! "Consi Taylor was about to bite into one of the Sainsbury’s bananas, she realized that white spots she assumed were bits of mold..." I\\\'m sorry, what? Your bananas are moldy, and you\\\'re eating them? Sorry, but can we talk about THAT for a moment? To quatermass, The Brazilian wandering spider can survive being frozen and boiled. They're basically satans of the earth. Which other London has a Sainsbury's, of course its the UK. They don't actually freeze the bananas they just adjust the temperature to like it is in a fridge to limit the maturing of the bananas, so if these Brazilian spiders survived then I guess they can manage extreme temperature changes, which can depend on what part of Brazil they came from! I presume this isn't in the UK? Our shops get frozen bananas so the creatures would be dead. Phew! In southern germany a supermarket was closed by an "spider-accident" in October this year. An employee of the market was bitten by a brazilian banana spider. The market was closed until a team of specialists could find the spider in the market. 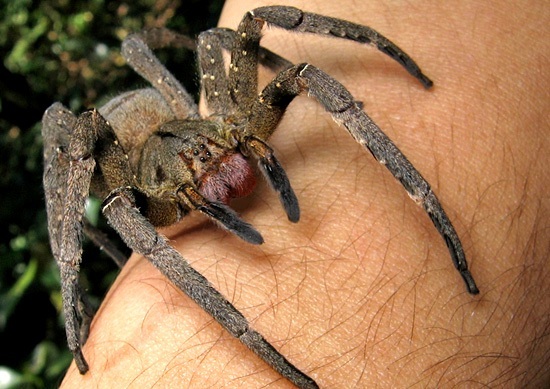 I find it strange that one of the photos of the \'deadly\' spiders shows a large spider on someone\'s arm. I guess they didn\'t get the memo. 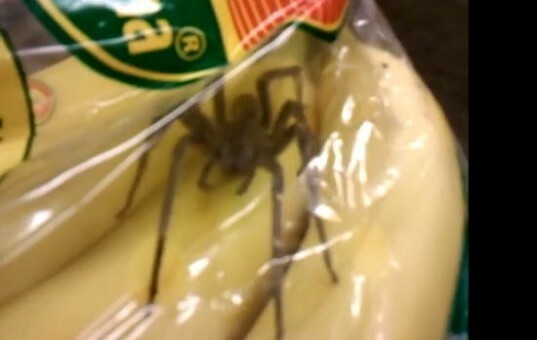 A London mother’s worst nightmare came to life when she found dozens of venomous spiders crawling over a bag of newly-purchased bananas. Just as Consi Taylor was about to bite into one of the Sainsbury's bananas, she realized that white spots she assumed were bits of mold were in fact dozens of tiny baby spiders that Taylor had the presence of mind to photograph. They turned out to be infantile Brazilian wandering spiders, which are among the world's most deadly arachnids.